Bubble Guppies: Animal School Day HD Truly makes learning fun! Hats Off to MTV Networks for presenting this app for us! 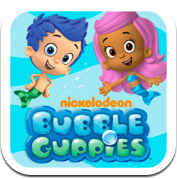 Bubble Guppies is packed with Animal School Information that is presented in a very comical, fishy way! Kids will learn about animals, their environment, foods, characteristics, and more in the “classroom” under water. There are games to interact with (two of which are in videos here) that teach about feeding animals as well as rescuing animals in need. This app has so much content on so many animals it is a must have app! What a fantastic combination of fun, facts, and life skills, all in one app! Kids earn Gold Stars (Fish) and stickers upon completing each exercise. We all know kids love stickers, praise, and Nickelodeon! They can then go to the doghouse and decorate with their winning! You can pinch out and in to change the prize sizes and place them where you like. Toss the ball and watch the action. This is A Gold Star (Gold Fish) App. Teacher, Preschool, Caregiver, and Parent alert – you want this app! Take A FieldTrip and Rescue and Animal!